The Ratpod website is www.ratpod.org. What is Ratpod? Only the coolest bike ride ever! I've done it twice. One time solo and another time with a friend. Both were equally enjoyable. The route starts in Dillon and heads over two mountain passes; Badger and Big Hole. Then it drops into the stunning Big Hole Valley where your surrounded by four mountain ranges and no cars! Finally, you follow the scenic Wise River, then through some rollys and back to Dillon. It's a great ride and an even better cause. 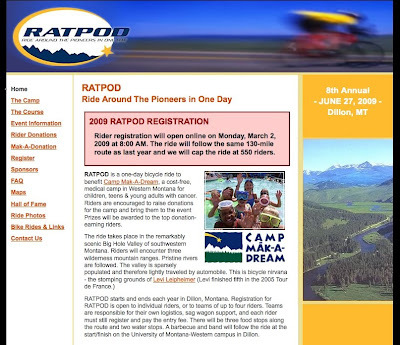 Read up on Camp Make A Dream and Ratpod on their website. Note: This ride fills up fast, so if your interested I suggest signing up on Monday. Great racing the last two days of the Tour of California. Frank Schleck was an animator to say that least. On stage 7 he jumped in a star studded breakaway and made some noise with his brutal attack on one of the finishing circuits. Weening worked hard for the victory and seemed to be making all the right moves but you can't out fox a veteran. Nocentini outwitted his two younger companions. In theory Roulston should have won with his track background, but his breakaway mates made him lead out the sprint. If you haven't seen the Velonews Gallery from Mt. Palomar, check it out, http://velonews.com/article/88568/party-on-palomar. Craziness! That stage was a tour stage. When both Schlecks were in the selection I was having major flashbacks of 2008 tour stages. Andy Schleck just drilling it on the front. In the end the GC had no big differences. I mean with Rodgers, DaveZ, and Levi your not going to get a lot of attacks on the climbs. They're all great climbers but not stop and start climbers like Schleck or Contrador. I wish Jacque Maynes could have stayed with that group. The two strongest riders who weren't factors in the GC eventually got up the road. I loved seeing Schleck wait for Nibali on the last climb of the day. If you watched the full coverage then you noticed that there was definitely something going on between the two riders. It seemed like they couldn't get their agreement together. It looks like a casual version of the Missoula Hell Ride will start next Tuesday. It's a great time to head out if your out of shape or new to the sport. There should be some folks there to keep things light and informative. However......more importantly next week is the start of a UM tradition. TACO WEDNESDAY TIME TRIAL starts next Wednesday at 5:30 (early starts available, contact me). Yes, TWTT....I know the name doesn't sound good but it was more important to get riders then to have a cool name. I've got my clipboard, my whiteboard, my profesh stopwatch, and lots of ground beef. I've dug up all the old times so the next generation can compare. I'll post a race report each week. I look forward to see who's been training, who will get faster each week, and who can eat the most tacos. Look for complete reports on who's riding what and who's shaving their legs already. Here's some pics from the original Taco Tuesday Time Trial end of the season party.